A big buck bunny will make a full meal for a family, but older cottontails like this one do take some time in the kitchen to break down the lean, tough muscles. Big game isn't the only meat on the menu — squirrel and rabbit are just as tasty. My friend Alan cut the motor and the boat glided to a stop underneath the branches that formed a shady canopy over this skinny river channel. We scanned the trees for any sign of movement while Dixie, a petite black Lab, shivered in anticipation. Just as I caught the flicker of a tail, Alan snapped a 20 gauge to his shoulder and fired. Before the squirrel dropped to the ground, Dixie was already out of the boat on a beeline to the base of the beech tree. Another squirrel for the pot. We won't go hungry tonight. 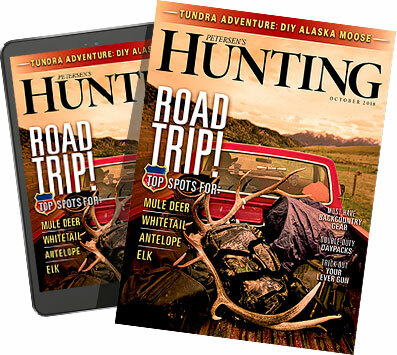 In the media, this publication included, big game grabs the boldest headlines, and few can deny the excitement of a trophy buck stepping from the brush or a branch-antlered bull screaming at dawn. But there's something about small game that tugs at the hearts of hunters who understand the old-school pleasure associated with the rattle of a squirrel cutting on a nut or the baying howls of a pack of beagles hot on the track of a bunny. For most of us, it goes back to our beginnings as budding woodsmen, small boys (and a few lucky girls) set loose in the woods with a BB gun or a .22 and a pocketful of shells. When it comes to the table, small game also gets overshadowed by fancier fare, but few hunters would argue with a plate of fried rabbit put in front of them. There's a reason our grandparents, who were happy with any meat they could gather, called cottontails hedgerow chicken. Game meat, and particularly that from rabbits, hares, squirrels, raccoons and beavers, got many a family through lean times from the time of frontier settlement to the Depression. This is why small game should be on every hunter's menu. In his comprehensive cookbook celebrating the food of Appalachia, Smokehouse Ham, Spoon Bread & Scuppernong Wine, Joseph Dabney asserts wild game made frontier settlement possible. "Squirrels, rabbits and deer&apos;¦proved to be a godsend to people settling the mountain country," writes Dabney. "Even after homegrown pork and poultry became readily available wild game warmed the hearts and stomachs in many a mountain cabin." Focusing on small game in particular, Dabney writes, "The early Appalachian settlers did not discriminate in selecting their small game animals to eat — they consumed everything available&apos;¦possums fattened on the fall mast were an early frontier favorite, squirrels were eaten with relish, particularly from the stewpot and as a dumpling dish." Perhaps because of this connection to Appalachia and the continued popularity of small-game hunting in the eastern mountains, squirrels and rabbits are often considered simple fare. True, the meat is more familiar today in rural areas south of the Mason-Dixon line than much of the rest of the United States, but that's only because everything west of the Mississippi tends toward livestock production in the form of hog farms and cattle ranches. Even the wild game out West tends toward elk and mule deer, despite the fact squirrels, cottontails, and jackrabbits can be found here in abundance. Despite their lack of antlers, cottontails, squirrels, and other small game are trophies worth sharing on social media, and with friends around the dinner table. In Europe, small game doesn't have the same humble reputation, and a fat rabbit is often feted as the centerpiece of a fine meal. The Italian word cacciatore translates to hunter in English and was originally made with the hares of the Mediterranean peninsula before someone made it universally popular as a chicken dish. The long slow braise, complete with tomatoes, herbs, and wine, is an ideal method to soften the tough, dry meat of a big European hare, but certainly not the only one. The French, Belgians, Brits, and even the Germans with their famous hasenpfeffer have traditional recipes elevating small game to lofty culinary peaks. The one thing all these recipes, across cultures, have in common is the cooking method, which almost always leans on a long braise or stew in a flavorful liquid, such as cider, wine, or stock. Rabbits and squirrels, as well as less traditional game, such as possums and raccoons, tend toward the tough side, with very little (or no) marbling and intramuscular fat. Small game is lean meat, and keeping it moist is paramount. Only young squirrels and cottontails should be cooked hot and fast, and even they benefit from a parboil or short simmer before getting dropped in the fryer. Back on the Apalachicola, that's just what Alan and I did, gathering a large group of Alan's river-rat friends on the bank for an old-fashioned fry-up. Some of them brought along some perch, and one old-timer had a secret hush-puppy recipe and gallon jar of pickled okra. It was as country as it gets, complete with a jar of moonshine passed around after dinner. Though I've hunted around the world, I'm not sure I've eaten finer fare — or had a finer time — than that heaping plate of fresh, fried squirrel.